The Illustrated Property Guide was created for large properties (>7500 sq ft) which can sometimes get pretty expensive to floor plan … due to their sheer size, or complexity, or number of rooms, or footprint on the ground — or all of the above. For large properties, Grand Estates, or Ranches on acreage .. you may find this product suits your marketing needs much better. Similar to a SMARTePLAN, the format of The Illustrated Property Guide is an easy-to-work-with PDF file that summarizes the attributes of a property in an attractive 2-page format that also has embedded links for the high definition photography and detailed descriptions as patented by SMARTePLANS. 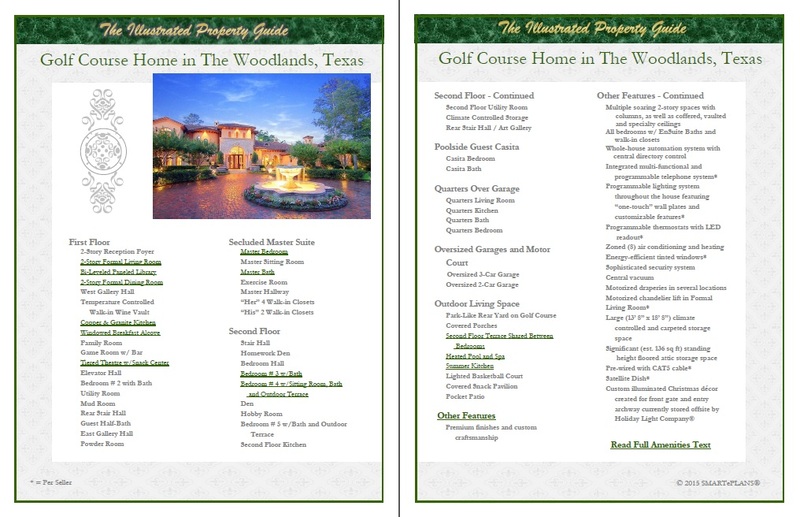 You can click the Image to tour a Golf Course Property in the Woodlands utilizing the Illustrated Property Guide. As a comparison, you may also tour the (same) property utilitizing a SMARTePLAN floor plan. As you can see in your comparison between the two different products, no detail is lost…. the property is showcased superbly. What Are the Differences Between a SMARTePLAN and the Illustrated Property Guide? Since a floor plan isn’t being created and inter-linked with the text and photos, the price per sqft drops from 20 cents per square foot to .07 cents per foot. SMARTePLANS are costed to include up to 14 photos/videos embedded into the floor plan. The Illustrated Property Guide is costed at a base rate, allowing you to embed as many photos as you want at $ 40 per photo page or $100 per video segment. There is a 10 photo minimum for the Illustrated Property Guide. While Amenities Text is an option for a SMARTePLAN, it is a requisite for the Illustrated Property Guide. The pricing is $75 per hour. Based on the size of your property, I can provide you an estimate of the Amenities Text for your job. The Illustrated Property Guide will have a much shorter turn-around time than a SMARTePLAN as a neither the RoughOut or the floor plan drawing are being created. The “look” of the layout can be wholly and completely customized to you / your broker. Frequently, these large types of properties are not marketed within the MLS system per the express wishes of the seller. If that’s the case … the pages of the Illustrated Property Guide can be created to include your logo, photo, contact information, etc. which is consistent with property materials being marketed privately. We are pleased we have been able to respond to your needs regarding large properties and can now offer a product like this at a lower cost and with no maximum on the amount of photos used, yet still maintain the high quality property visualizations that is the hallmark of SMARTePLANS. We’re excited about this new product and look forward to answering any questions you may have. SMARTePLANS: We Do So Much More For You!